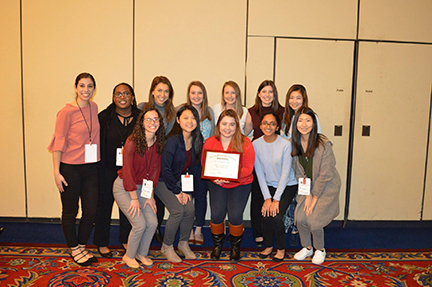 PittPharmacy’s APhA-ASP chapter won the 2017-2018 Generation Rx Award for Region 2 at the APhA-ASP Midyear Regional Meeting. With the collaboration of 223 student pharmacists, faculty and pharmacists, the 2017-2018 Pitt Generation Rx initiative achieved outstanding results. Its 26 events were designed to educate both student pharmacists and community members of all ages. The initiative educated 1,324 individuals ranging from kindergarten students to geriatric participants. The lecture series by GenerationRx educated 127 student pharmacists about medical marijuana, the opioid epidemic, naloxone use and the DEA’s role in these issues. Within the community, the initiative delivered high school presentations at 8 high schools to 476 students. 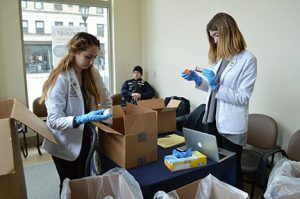 Additionally, the two drug take-back initiatives were advertised to over 200,000 people and collected over 700 pounds of unused and expired drugs from the community. Several new initiatives, including the health fairs for undergraduate students and tabling at the Pitt Women’s Basketball game, expanded the reach of Generation Rx to new patient populations. Finally, through public relation initiatives, the committee reached over 4,122,400 individuals, the highest number ever reached by Pitt’s Generation Rx Committee.